What is a healthy store? Why are healthy stores important? The retail environment has a significant impact on community health. In many places, residents lack access to fruits and vegetables, but can find tobacco, non-nutritious foods and beverages, and alcohol all too easily. And perhaps not surprisingly, tobacco use, poor nutrition, and excessive alcohol use are among the leading causes of deadly illness in the United States. But it doesn’t have to be this way: Research suggests changing the retail environment can help prevent chronic disease. Stores that make the healthy choice the easy choice—by reducing tobacco marketing, stocking nutritious items, and not selling alcohol near schools, for instance—can actually improve community health. Public health practitioners in tobacco control, nutrition, and excessive alcohol use prevention are already doing this work, but most are not working together. 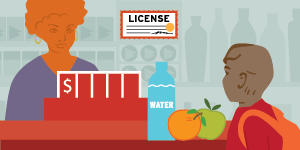 To create a healthy retail environment, these agencies have a unique opportunity to collaborate and coordinate their efforts. Using the resources below, these agencies can work with policymakers, residents, and one another to develop a comprehensive approach to improving the retail environment. create a retail environment where it is easier to make healthy choices than unhealthy ones. Read the examples to picture what a healthy retail environment could look like in your community, and use the strategies and policy options to get started. This set of 4 one-pagers introduces the rationale behind and benefits of a comprehensive approach to the retail environment. Use the sample talking points in each of the conversation starters below to identify shared goals and make the case for collaboration. Why should government agencies think about the retail environment comprehensively? Where are there opportunities for government agencies to collaborate in the retail environment? What could a comprehensive approach to the retail environment look like? How can government agencies benefit from taking a comprehensive approach to this work? This step-by-step guide discusses strategies for forming a partnership among tobacco control, nutrition, and excessive alcohol use prevention programs. Read the examples and case studies to see partnerships in action, and use the activities, scripts, and worksheets to build relationships of your own. 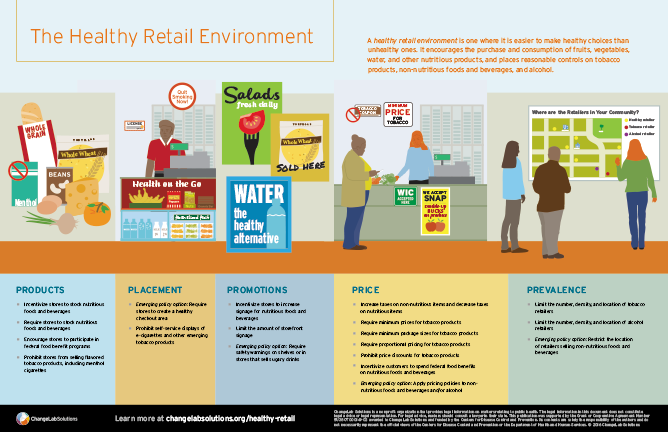 To learn more about building a healthy retail environment, see our complete library of healthy retail resources. Contact us for more information!